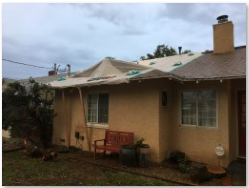 The insurance company had sent a team of guys with plastic tarps to cover up the now vulnerable roof, attic, and house as there were areas where the tree got all the way through. It was a bit apocalyptic and existential to experience the debris in the affected 1/3 of the house. 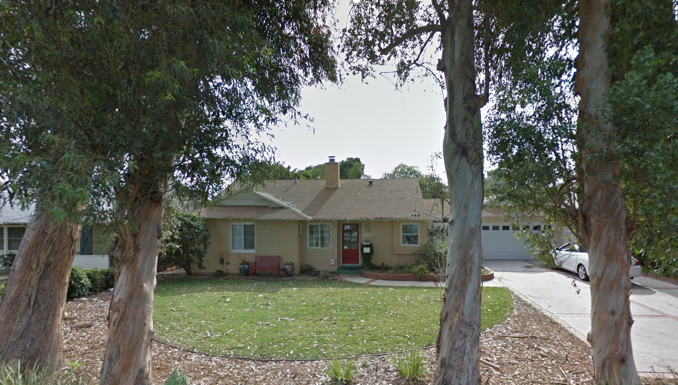 When looking at the front of the house, most of the impact was to the left front room. 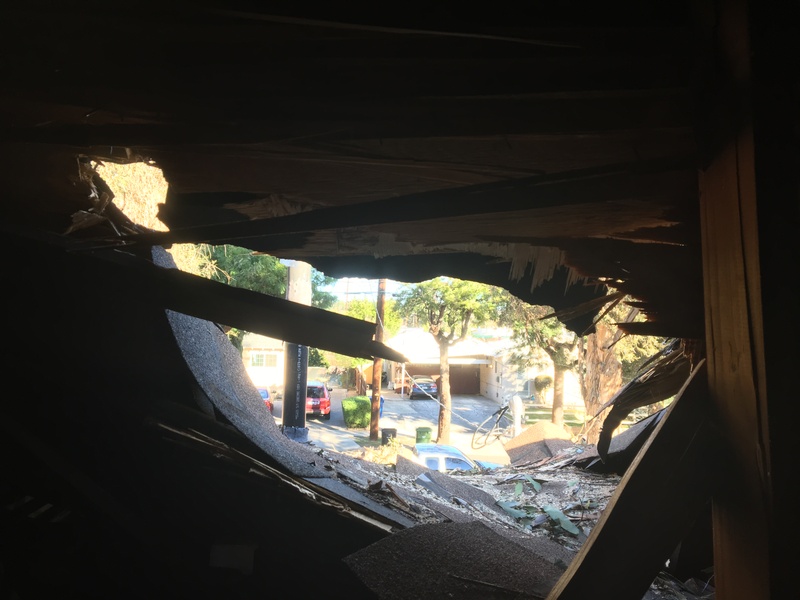 On the inside, the insulation, bark shards, branches, and pieces of roofing were primarily in that front room, but the impact was clear from the front to back. The cracking of walls and moldings was visible down the interior hall, into the full bath, into the master bedroom and on out to the back patio area. We have not lived in LA during any kind of earthquake activity worth the mentioning, but we have been told that’s the kind of jolt the house took. Of course, our morbid curiosity would love to know what that sounded and felt like but our more rational selves realize it was really good we were not there to experience it. The master bedroom was in the direct line of the action and we most certainly would have been woken from a peaceful sleep by a un-forgettable and petrifying jolt. Our friend David had moved Vonnie and Mikes furry babies from the room of greatest impact to the safety of the room next to it. We knew Sharon, our cat sitter, had gotten to the house soon after we had called her the day before and all 4 fuzzy heads had been accounted for. 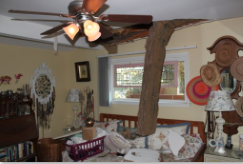 Vonnie’s cats, Jimbo and Hobbs would, if they could, have the greatest story to tell as a giant branch hit directly into the room they were in and all the mess fell around them. We fear there may be some kitty therapy in their futures. Our Cats, Cotton, and Nala had been held up in the back of the house in the master with access to the outdoors into the secured cat habitat through the cat door. They had also conspired to keep the story between them and refused to answer our questions about what they had experienced. Thankfully, they all fared well enough, mostly appearing completely unfazed. Our first concern was if it was safe enough to stay the night and actually, we never really got an answer to that question, as we did not actually ask it. I did not want to leave my wounded home and simply wanted to stay inside its safer cleaner areas and project our love for it with our presence in it. While still in Houston we had begun conversations with our insurance company and by this time I was confident that although they had been fast to secure the property, the guy I was talking to did not comprehend the magnitude of the situation and of the potential danger and loss. In fairness, he had not yet seen the photos or had access to the inside. Tobin got up and went to work on Thursday and I started to assess the process ahead. Having been frustrated by my conversations with the first insurance company guy I/we realized that an independent adjuster would probably be a good idea. With help from my brother, we started to research an independent adjuster in the area. We probably should not have been staying at the house and our insurance would have covered a hotel, but my nesting instincts had kicked in and I just did not want to be away from our greatest worldly possession. We also had the cats to worry about. The 2 nephews kitties were safely back with their parents, but Nala and Cotton were our concern. I felt that the greatest danger to us would be that in the event of an earthquake we would be more vulnerable than otherwise but that under normal circumstances we were not in immediate danger. On a side note, we were on the cusp of the rainy season in Southern California. Little did I know that we were in for the rain that would end the 6 -year drought. Will this sheet of plastic keep out the deluge? Stay tuned!